(Miami, FL) – The spirited teens of MY LITTLE PONY: EQUESTRIA GIRLS return to Discovery Family with three brand new half-hour specials, where they meet new friends and embark on even more fun adventures! Full-time students and part-time magical pony-girls, the Equestria Girls are always ready to save the day with the Magic of Friendship! The premiere of EQUESTRIA GIRLS: DANCE MAGIC kicks off the fun on Saturday, June 24 at 11:30a/10:30c and will stream live and on demand on Discovery Family GO, the network’s TV Everywhere app. All three specials will premiere during the network’s annual fun-filled “Summer Splash” programming event. With the Camp Everfree fundraising deadline looming, the Equestria girls realize they need a new plan to raise more money and are ready to try new things. Rarity finds out about a music video competition with a huge cash prize, and she’s eager to convince her friends at Canterlot High to enter the contest. However, the girls soon learn that the students at rival Crystal Prep Academy are also entering the contest. The girls learn that sometimes coming together instead of competing, is the best plan of all! 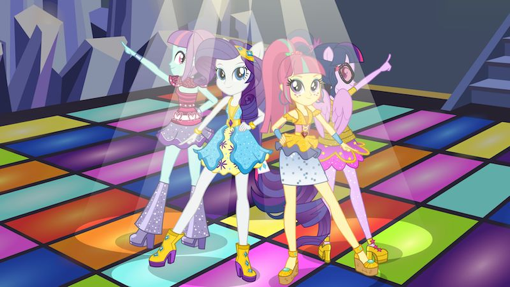 The overjoyed Equestria Girls have been specially invited by A.K. Yearling to visit the set of the upcoming ‘Daring Do’movie! For super-fan Rainbow Dash, watching behind the scenes as her favorite heroine comes to life is a dream come true. However, when a rare prop from the set goes missing and puts the entire movie on hold, Rainbow Dash’s dream becomes a nightmare. The Equestria Girls take it upon themselves to track down the missing prop and end up trotting into a real-life Daring Do adventure! When Sunset Shimmer returns to Equestria as a pony, she meets new pony Starlight Glimmer and agrees to bring her back through the mirror portal to experience life as a human girl at Canterlot High. However, while Sunset Shimmer is away, a revenge‐seeking Juniper Montage finds a beautiful hand mirror enchanted with Equestrian magic and it’s powerful enough to make things disappear into limbo, trapping them between two realms. Sunset Shimmer and Starlight Glimmer return to find the Mane 6 missing and Juniper Montage acting extremely suspicious. Will Sunset Shimmer and Starlight Glimmer save the girls, or are the Mane 6 lost in limbo for good? MY LITTLE PONY: EQUESTRIA GIRLS is produced by Hasbro Studios for Discovery Family. Stephen Davis is the executive producer for Hasbro Studios. To learn more, go to www.discoveryfamilychannel.com, on Facebook at www.facebook.com/DiscFamily and on Twitter @DiscoveryFamily. The leading television destination for families in the United States, Discovery Family is available in more than 60 million U.S. homes and is a joint venture of Discovery Communications and Hasbro. Discovery Family is programmed with an inspirational mix of original series, family-friendly movies, and programming from Discovery’s non-fiction library and Hasbro Studios’ popular animation franchises, including MY LITTLE PONY: FRIENDSHIP IS MAGIC, LITTLEST PET SHOP and the Emmy-winning TRANSFORMERS RESCUE BOTS. Families can enjoy their favorite shows anytime, anywhere through Discovery Family GO – the network’s first TV Everywhere app offering live and on demand access to complete seasons of your favorite Discovery Family series and specials. For 2017-to-date, Discovery Family ranks as the #1 most co-viewed kid’s network among Kids 2-11 watching with an Adult 18-49 in Total Day and Prime.